Companies use advanced analytics to discover patterns and anomalies in large volumes of data, and then use this insight to predict the outcomes of future events and interactions. In addition, advanced analytics is used for optimization and complex event processing and analysis. With advanced analytics, your organization can adjust its plans and strategies to become more competitive, minimize potential risk and optimize decision-making in real time. In this report we assess the performance of major providers of advanced analytics solutions and provide insight into how their customers are benefiting from these solutions. 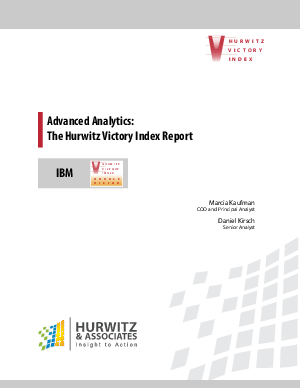 The Hurwitz Victory Index scores vendor performance across four dimensions – Vision, Viability, Validity, and Value. Each dimension measures important components of a vendor’s overall ability to deliver innovative solutions, outstanding customer service, and the business and technical value customers demand. IBM, SAS, SAP, and Angoss all achieved Double Victor status, receiving a Victor rating in both Go to Market Strength and Customer Experience Strength. Pegasystems also received a Victor rating in Go to Market Strength. StatSoft, Revolution Analytics, RapidMiner and Megaputer are Leaders in Go to Market Strength. Megaputer and RapidMiner are Leaders in Customer Experience Strength. The startup, Predixion, is rated a Challenger in Go to Market Strength and Customer Experience Strength.